The Old Course, St Andrews is rated 4.6 out of 5 based on 18 verified reviews from YGT customers. For avid golfers around the world, playing The Old Course is the ultimate bucketlist golf experience, offering the chance to follow in legendary footsteps of past Open Champions including the likes of Bobby Jones, Jack Nicklaus and Tiger Woods. Widely recognised as ‘The Home of Golf', St Andrews and its famous Old Course offers you the chance to enjoy a round in the shadow of the R&A Clubhouse, and to tackle famous landmarks like the Swilcan Burn, Hell Bunker, The Road Hole and the Valley of Sin en route around the links. It is hard to argue against the fact that this is the most icnonic golf course in the world and one that all golf enthusiasts should experience at least once in their lives. Nowhere else in the world will you find a place that is so enthusiastically devoted to golf as the town of St Andrews, which makes the Old Course experience all the more charming and memorable. Please call direct on 0800 193 6610 to enquire! 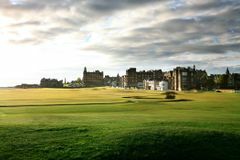 Golf tours in St Andrews are an incredible experience and, needless to say, The Old Course sits at the head of this golfing paradise. Nobody is sure just how long golf has been played on this hallowed links, but what is for certain is that the St Andrews Old Course is among the very oldest on the planet and what is arguably the world’s most famous course has acted as a blueprint for all those which have followed since. Teeing off in the shadow of the R&A Clubhouse is a daunting experience despite the vast fairway you’re presented with and from there on in, while making your way around the course, you’re completely at the mercy of the elements, with the persistent see breeze constantly changing the character of the challenge at hand. While the course itself is sure to surprise you if you’ve ever watched The Open here – TV coverage seems to flatten the course and once on the course the humps, bumps, dips and swales are much more pronounced and dramatic than you might think – iconic landmarks and course features such as the Swilcan Burn, Swilcan Bridge and the Valley of Sin will no doubt be familiar, evoking memories of the great champions to have won here down the years. The course is routed in a rough anti-clockwise loop and after making the turn; the long homeward stretch builds with moments of drama, including the long 14th, the nervy 16th with out of bounds flanking the right side of the hole, and of course the unrivalled challenge of The Road Hole, which is played in the shadow of the stunning Old Course Hotel. In 2015, The Open made it customary return to “The Home of Golf” as it does every five years, when the 144th Championship was contested over the famous St Andrews links in July. Despite Mother Nature not playing nice, it was a cracker of a tournament once again at St Andrews, with a three-way Monday playoff required to decide it. Zach Johnson emerged victorious over Louis Oosthuizen & Australian Mark Leishman, winning his second career major. Past Open Champions at St Andrews include the likes of Bobby Jones, Jack Nicklaus, Seve Ballesteros, Jack Nicklaus and Tiger Woods. It was here too where, in 2005, Nicklaus waved an emotional farewell from the Swilcan Bridge as he drew the curtains on a remarkable career. Book a St Andrews golf tour to have your chance to follow in the footsteps of the game’s legends and experience the world's most famous golf course. That’s what two-time Masters Champion, Ben Crenshaw had to say about the world’s most notorious par 4, The Road Hole at St Andrews. Widely regarded as the toughest par 4 in golf, The Road Hole is one of many iconic holes on the Old Course. Job one is clearing the railway sheds in front of the Old Course Hotel with your tee shot; a tough enough task in itself. From there you play towards a shallow green with a stone dyke running across the back and, of course, the dreaded Rod Hole Bunker protecting the front of the putting surface. Who could forget Miguel Angel Jimenez playing a ricochet shot when he found his ball up against the stone wall; or the many cases of the best golfers in the world taking more than one attempt to extricate their ball from the Road Hole Bunker? Walk off with a par on the card here and feel free to give yourself a big pat on the back! A short walk from the Eden Clubhouse, The Academy provides golfers with all the facilities they will need to warm up before heading to the links. With 60 floodlit bays and 22 indoor bays, The Academy is a comprehensive facility where golfers can practice their driving, iron play, pitching, bunker play and putting. There’s even a replica of the Road Hole Bunker so you can practice getting stuck in it before it actually happens! The Links Clubhouse at St Andrews is the ideal place for golfers looking to play the Old Course to change, store their non-golf attire, shower and enjoy a bite to eat or a well deserved drink, whether it be before or after their round. Enjoy a hearty meal after a day spent toiling on the links in the Swilcan Restaurant, or a Tom Morris cocktail on the roof garden while overlooking the majestic St Andrews links land. Golfers can park their cars for free at The Links Clubhouse. Travelling light without your clubs? Not a problem as St Andrews has a large stock of premium rental clubs, trolleys and even shoes for your use. Due to the nature of the Old Course, golf buggies are limited and can only be booked by golfers who are registered disabled with a permanent condition of disability. These will be driven by a qualified caddie driver and while the buggy is provided free, the appropriate caddie fee should still be paid. It is highly recommended that you take a caddie for your round on the Old Course. The St Andrews caddies are trained to assist in all aspects of enhancing the player’s experience and know the course like the back of their hands, which will no doubt save you some valuable shots as the vagaries of links golf, especially on the Old Course can often leave first-timers a little dumbfounded. Caddie availability cannot be guaranteed, although it’s highly unlikely your request won’t be able to be accommodated. Due to the inherent location of links golf courses such as the St Andrews Old Course, golfers may well experience all four seasons in one round of golf so pack accordingly. Even if you’re teeing it up on the Old Course in high summer, be prepared and pack waterproofs as well as warm clothing just in case. Be sure to pack a camera. A team photo on the Swilcan Bridge is a must! Get a Caddie, expensive but well worth it as he kept me out of trouble and helped me read very challenging greens. I shot 79 (playing off 12) on the Old Course, must have been divine intervention. Don't worry about your score and just enjoy the experience. The people were exceptional and the weather was equally as good. An amazing trip playing on the famed Old Course at St Andrews. Once you've done it, you'll want to play it again and again. Tip - if you have a few extra days to spare, put your name down when you arrive to go into the daily lottery for an extra tee time to play the course again. The course needs no recommendations, it is everything you have heard about it. Tee boxes looking down tight fairways covered with bunkers and gorse. The biggest shock is the size of some of the greens, especially the shared greens. Although not long, the clever design and the integral hazards make the old course a real test of where to put your golf ball. After drooling all the way round you eventually reach the 17th tee. So may famous incidents. Have you got the bottle to put your drive over the lettering on the sheds?? That`s only the start of it. And then teeing off down 18 over the swilken bridge and impossible not to be seen by the many passing onlookers. Par par finish and life is complete. We went in March, the weather was fantastic which makes the game a lot easier! Hire a caddie, great entertainment and advice! The Old Course is the Old Course, it is a must do bucket list. The 1st, 17th and 18th is why you play there, take in the history! The Old Course is the holy grail for a true golfer, as the majesty and history of this magnificent course hangs in the air. This in turn, raises hairs on the back of the neck when walking down that first fairway and leaves spectacular memories, which will linger forever in the memory. To avoid a bunker on The Old Course is like dodging air, however I managed this on my very first trip, which resulted in a stableford score of 39. Although the first four holes are quite simplistic in Championship terms, the dynamics of the game change along the way, presenting some interesting shots, but God forbid you land in any of those dreaded bunkers, some of which my three playing partners failed to escape from. A pure delight and a must play venue for all decent golfers. We had an unbelievable trip to St Andrews to play the Old Course! I took my son, Daniel as a 21st present, and we played the Dukes and the Old Course. We stayed in the Old Course Hotel and our suite overlooking the course couldn't have been better. The full Scottish breakfast is a must too! The Dukes course is a tremendous challenge and the Old Course was truly memorable, especially as we played it in the most difficult of weather conditions. Who could ever forget teeing off in front of the Home of Golf, launching a drive over the railway sheds on 17 and walking over the Swilken Bridge on 18?! It was a truly unforgettable experience and a definite 10 out of 10 from us! Our round on the St Andrews Old Course was fantastic overall. I would recommend booking a caddy as they are very good for anyone playing the course for the first time. My wife and I played three courses in the area and found them all to be challenging but beatable if you played well. We hope to repeat the experience before we're very much older! I would give The Old Course 4 out of 5 as it's a great experience. Happily my round on the Old Course was the best I've played tee to green but unfortunately I managed to three putt 12 of the greens! Maybe that tells you something about the course! I managed a gross 90 playing off 14. The Old Course was excellent and am pleased to have ticked it off my golfing bucket list. I would recommend booking a caddie for the Old Course as they greatly enhance the round. We have a small 6 person society which meets twice yearly, it was one of our member's 70th birthday and the Old Course was on his bucket list...easy choice! We had a marvellous trip so many thanks to your company. Would like to play here again as everything was 5 out of 5 from the condition of the course to the facilities in the hotel. We were able to play golf even after overnight snow! They moved up the tee times for 1 hour so we could play in great conditions. The nerves start getting to you when you have to tee of on the 1st on the Old Course and the birdie putt I made from the Valley of Sin on the 18th will be in my memories for as long as I live. Also the extent to which the boys enjoyed the course was unforgettable. We will be back to play the Old Course again. The condition of the course when we played it was 4 out of 5 but guess that is to be expected in March! Would like to play The Old Course again as I thought the whole experience was great and the condition of the course was 5 out of 5. We played here as part of a golf tour including Kingsbarns and the New Course. Unfortunately we found the Old Course uninspiring. That being said, it was still great to have played it for the history of the course but I probably wouldn't play it again. Something every golfer has to experience. Standing on the 1st tee is a something I'll remember forever. There are some really good holes that you might not even remember from watching it on TV, the par-3 11th for example is an absolute belter with the large 'Strath' bunker protecting it at the front and a green which is steeply faced towards you it is one of the best I've played. Walking up the 16th, 17th and 18th is one of the best feelings you'll get as a golfer and walking into town for a drink at the Dunvegan pub is a must! Q - Can I play The Old Course at St Andrews? A - Yes, all advanced bookings are sold as a 2 round package with one of the other 6 courses operated by The Links Trust. A select group of agents are authorised to sell accommodation packages which include a guaranteed tee time on The Old Course, which will typically start with a 3 night stay in St Andrews. Q – What is the handicap limit to play The Old Course? A – Male golfers are required to have a handicap of 24 or less, female golfers are required to have a handicap limit of no more than 36. Q – Can I play The Old Course if I do not pre-book? A – Yes, the golfer will submit their name, home club & handicap to The Links Trust 48 hours before the day they wish to play, and will be notified by 4 pm that day if they have been successful. Q – Can I prebook a caddy? A – You certainly can and it is recommended. The best bit of advice that our clients would give to other golfers playing The Old Course is to get a caddy. Their local knowledge & experience is extremely helpful in navigating your way around the course for the first time.